Translating laboratory findings into cures takes years. It is costly and risky. We seek out promising, early-stage research aimed at non-mutation-specific therapies. We provide necessary funding both through direct donations and by partnering with other organizations, depending upon the monetary need. Loss of muscle strength and function is progressive in Duchenne patients. Dystrophin helps maintain and heal muscle after normal use. 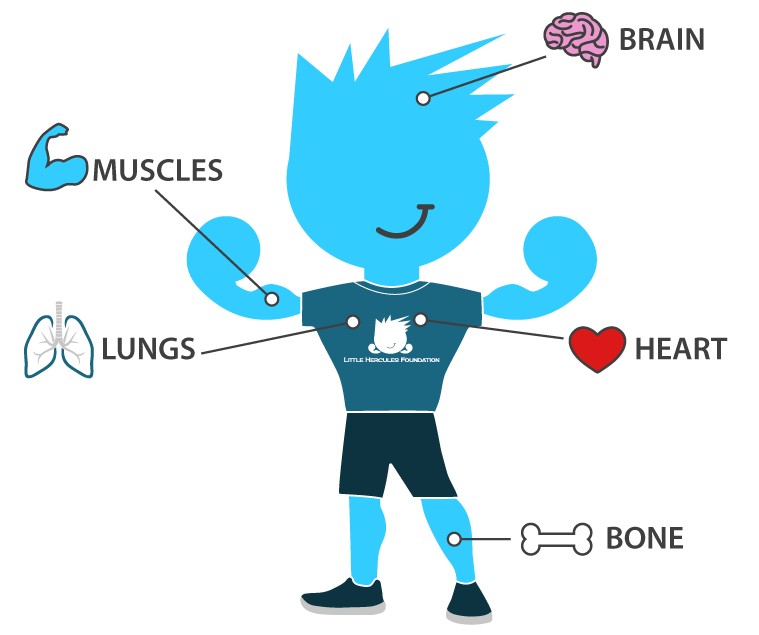 With little to no dystrophin production, Duchenne muscles are damaged and replaced by connective tissue and fat. Early on, common motor skills are delayed, followed by slow weakening of the core skeletal muscle in early childhood. This loss of muscle strength spreads to the lower and upper limbs in adolescence, taking away the ability to walk and to perform essential daily living tasks independently such as dressing, eating, and bathing. CRISPR-Cas9 is a revolutionary concept that allows for gene editing, which could potentially correct the genetic error that causes DMD. This technology has a long way to go before it reaches clinical trials, but it is both promising and very exciting! Duchenne patients typically have weakened bones and low levels of Vitamin D at onset. Steroids, commonly prescribed to address the skeletal muscle impacts, contribute to poor bone health by decreasing the calcium levels in bones. Over time, bones thin and become more brittle, leading to serious bone health issues, such as osteoporosis. This makes those living with Duchenne at high risk for fractures and breaks, which can have devastating impacts. With weakened skeletal muscles in the back, Duchenne patients are susceptible to scoliosis and compression fractures, often requiring serious, corrective surgery. Lastly, joints in feet, knees, elbows, etc. can become locked in one position as loss of ambulation occurs. A small amount of dystrophin exists in the brain. Without it, people living with Duchenne are more likely to have development delays in learning, behavior, and social/emotional health compared to their peers. Specifically, this can lead to weakness is executive function skills, such controlling impulses and emotions, flexible thinking, and working memory, and trouble with friends or in a school/learning environment. For patients and caregivers, this can often feel like the most complex and troubling impact to manage among Duchenne patients. Not only is the spectrum of psychosocial health so vast, but ensuring overall well-being and self-image is important as patients adjust to the stages of Duchenne and seek support from those around them. Your heart is a muscle too. The lack of a sufficient amount of dystrophin leads to weakening and scarring of the heart muscle. Although progression varies, heart disease will eventually affect all those living with Duchenne. The heart’s ability to pump blood properly throughout the body is impacted. Changes to heart rate and/or rhythm can also occur as patients with Duchenne get older. Damage to the heart, otherwise known as cardiomyopathy, begins in early stage before symptoms even appear. Cardiomyopathy and heart failure are the leading cause of death in Duchenne patients. Weakening of those muscles around the lungs that are critical to breathing, including the diaphragm, makes it difficult for those living with Duchenne to breathe and cough. Duchenne patients eventually breathe at an abnormally slower rate, increasing the amount of carbon dioxide in the blood. Breathing and coughing typically start to become problematic after the loss of ambulation occurs between the ages of 8-12. Patients may need to begin to use a breathing assist machine at night as teenagers, progressing into full time breathing assist or ventilation machines as young adults. Led by Dr. Keith Foster, this project seeks to address the challenges of adeno associated virus (AAV) delivered gene therapies, including immune response and systemic delivery strategies. Phase I/IIa trial in boys with Duchenne following a trial in Becker muscular dystrophy patients. Follistatin inhibits the myostatin pathway, which has shown to cause significant enlargement of muscle mass and increased muscle strength. Determining the mechanisms whereby a quercetin enriched diet interrupts disease processes in DMD. Anti-fibrotic/anti-inflammatory to keep muscle healthy and generate new muscle tissue. A surrogate gene therapy for DMD that uses a viral gene transfer vector to deliver the GALGT2 gene. In animal models, delivery of GALGT2 results in a change to glycosylation across the entire muscle membrane, with upregulation of utrophin and other proteins that stabilize the muscle membrane, resulting in correction of muscle pathology and force deficits. This is a particularly promising approach because it is a potential therapy for any boy with DMD, regardless of mutation. Read more about GalGT2 in our public statement of November 2016. A project supported by Parent Project Muscular Dystrophy and several Duchenne organizations, this gene editing therapy developed by Dr. Eric Olson shows promise to treat 80% of all Duchenne patients. Read the press release here. Relaxin is a natural hormone, which has a number of biological effects that may be of benefit in Duchenne muscular dystrophy (DMD), including its ability to regenerate muscle, reduce scarring and improve cardiac function. Duchenne Superhighway project to make clinical trial process faster and more efficient. Review of drugs to correct muscle degeneration using zebrafish model.